Henan Yulian Heavy Machinery Co., Ltd.
Impact crusher is a new type of high efficiency crushing equipment, features are: small volume, simple structure, big crushing ratio, less energy consumption, large production capacity, uniform end product size, and selective crushing effect, is a very promising device; Impact crusher plate hammer and counterattack plate is the chief drawback of particularly easy to wear and tear, especially broken hard ore and abrasion is more serious, often need to change. At present due to the emergence of some wear-resisting material, has been applied in some metal concentrator. Reaction type crushing function processing under 100-500 - mm length material, resistant to pressure up to 350 million mpa, big crushing ratio, material after broken cube grains, etc. Widely used in building materials, ore crushing, railways, highways, energy, transportation, energy, cement, mining, used to finely materials in chemical industry, etc. The row partical size can adjust, broken specification diversification. 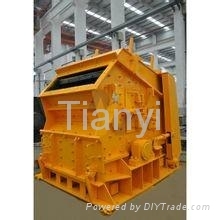 Impact crusher is a kind of impacting energy to crushing material crushing machinery. Machine work, under the drive of the motor, the rotor high-speed rotation, the material into the plate hammer function area, and the rotor plate hammer impact broken, and then again to counter device is broken, and then back to the board from the back plate hammer function area is broken again, this process is repeated, material from big to small back into one, two, three cavity repeated broken, until the material being broken to the required size, is being exhausted from port discharge. 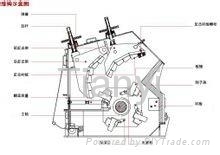 Adjust the clearance between the back frame and rotor can achieve the purpose of the material discharging granularity and material to change shape. Stone directly by the upper machine in high speed rotating wheel; In high speed under the action of centrifugal force, and the other part to bypass around the rotary table by way of umbrella slungshot produced high-speed collision with high density of crushing, stone after fighting each other, and between wheel and the casing in the formation of vortex motion caused by repeatedly hit each other, friction, crushing, from the bottom to discharge. Forming closed-circuit circulation many times, controlled by the screening. 8.Selective crushing effect, and the broken product granularity evener, mostly cube shape stones. For bridge construction, construction of the high-speed road, port, airport has a wide range of applications. 7.Back is equipped with multi-function hydraulic station, a hydraulic high-speed discharge gap and stable counterattack plate vibration and body automatically open, etc. 9. 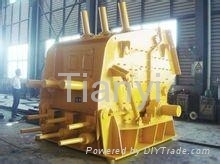 Multi-cavity uniform broken, is suitable for crushing hard rock.